A few months ago Archpriest Michael Oleksa gave a talk at St. Vlad's entitled "The Legacy of St. Herman and the Alaskan Mission Today." I listened to it on a plane ride nearly entranced by his ability to tell a tale. His delivery mixes the careful pacing of a master storyteller, the precise recall of a historian, and the empathy of an Orthodox Christian. If you haven't listened to this talk, I encourage you to do so not only because of the impassioned delivery, but because it gives a unique voice to the Alaskan Orthodox experience that you will be hard-pressed to hear anywhere else. As a very dedicated audiobook listener, I was heartened to see Ancient Faith Publishing delivering some of their titles on Audible and that heartening was followed by no little delight at discovering Fr. 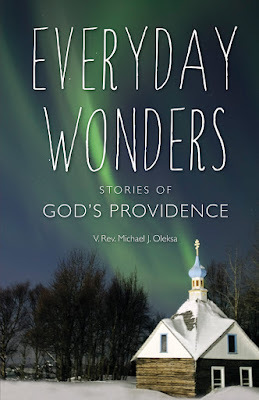 Oleksa's "Everyday Wonders: Stories of God's Providence" an available title. I downloaded it to my phone while packing on a Saturday before I got on the road to serve the Liturgy for a small rural parish to the west of me. At three and a half hours it was the right length for me to finish before I got back home. Much of what is popularly understood about Orthodoxy in Alaska and about the early years of its founding is simply wrong. We make assumptions about who was involved and what their motivations were in order to make a tidy, pious story of the conversion of Alaska. Fr. Oleksa almost gleefully pushes a plunger to the dynamite of those pre-packaged narratives as he recounts the historical facts and quotes the men who were actually there. Fr. Oleksa is not one to speak in grand terms with run-on sentences where one loses sight of the subject, the verb, of even both of those things. As a pastor and professor his goal is to engage and inform where others might seek to dazzle and impress. This book is not a treatise. It's a collection of stories about God's presence in our lives and how His love is manifested in both the truly miraculous and in what we might erroneously think of as just happy coincidences. He does so by way of short stories of his life in Alaska (with side trips to seminaries, Europe, etc.) that always tell you something special about the place only a person who had actually been there would know and something about how God blesses his people even in the remotest corners of civilization. The audio quality is much more akin to a podcast than your run-of-the-mill audiobook. I am reminded of listening to Fr. Hopko's podcasts (or as he called them "stream-of-consciousness musings") where his words might be joined with that of a bird chirping in the background or a door opening or the rain. Fr. Oleksa might complete one chapter at one audio level and start another one at a completely different level. The imperfect production value doesn't detract from the stories, but if you find yourself in a car as I was, you might have to make small adjustments to the volume button. Give this book a listen (or a read). You're going to learn something new and have something to talk about at your next parish coffee hour. St. Herman is going to be a much more three-dimensional character when his feast day comes around. Matushka Olga is going to find a place in your heart. Fr. Oleksa's articles are going to get your immediate attention when you come across them online. You might even find yourself reconsidering those advertisements for pilgrimages to Alaska that dot the calendar. If you do listen to the book, please put your impressions in the comment box. I am immediately impressed. His understanding/definition of culture and his place in it (e.g. his awareness of his "4th century attire" ;) ) is such a contrast to the false understanding(s) such as that displayed by the Greek-American Rev. Alexander Karloutsos.